Thank you for considering the Co-op Food Stores to retail your products. Please fill out the following information below to begin the process of being considered as a vendor for the Co-op Food Stores. Please describe your product in 250 words or less. Please provide and attach as many of the following files as possible into a single PDF, Word, Excel or Zip file below. Allowed file types: txt pdf doc docx ppt xls xlsx rar zip. 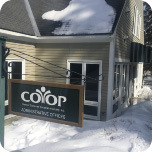 To ensure that we receive your product, it must be sent to the Co-op’s Administrative Offices. Depending on which shipping method you use, please note the difference in addresses.